Romanian mine sweeper Sub Lieutenant Alexandru Axente heading to the south. 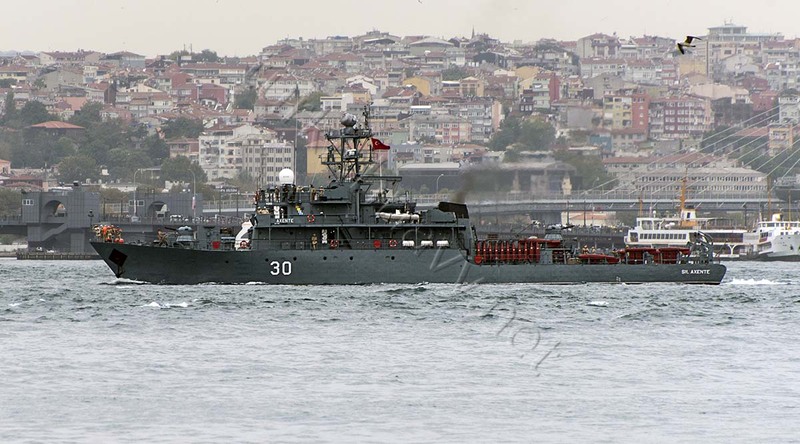 Alligator class Russian large landing ship Nikolai Filchenkov carrying cargo to Syria. Photo: Yörük Işık. Used with permission. Alligator class Russian large landing ship Saratov carrying cargo to Syria. Photo: Yörük Işık. Used with permission. Russian auxiliary cargo ship Yauza heading to Syria with containers on board. Photo: Yörük Işık. Used wtih permission. 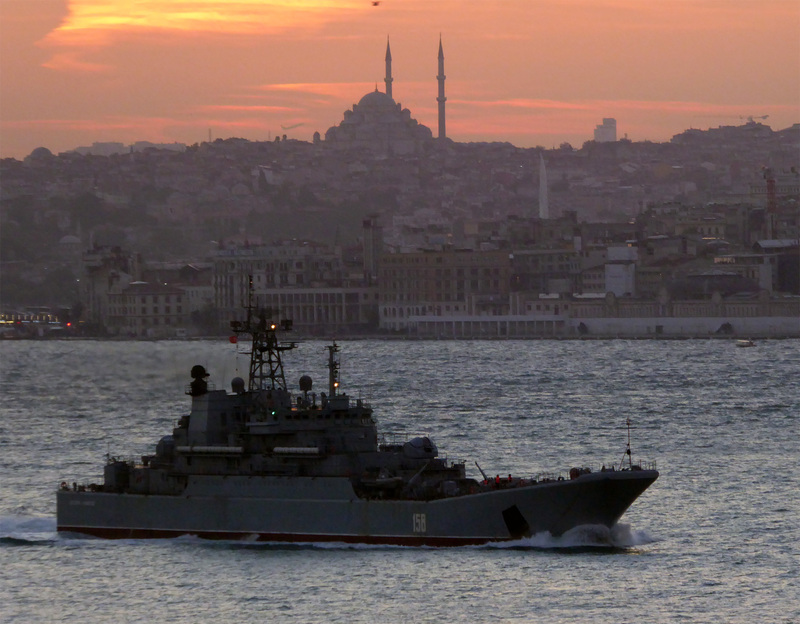 Russian landing ship Tsezar Kunikov returning from her ecent deployment in Syria. Photo: Alper Böler. Used with permission. Ex M/V Alican Deval, the new Russian auxiliary cargo ship Dvinitsa 50. Her trim is not set correctly as she list to starboard. Photo: Yörük Işık. Used with permission. Bulgarian frigate Drazki on a rare deployment to the Mediterranean Sea. Photo: Alper Böler. Used with permission. Photo: Yörük Işık. UIsed with permission. Russian Amur class repair ship PM-56 is going to replace the PM-138 in Syria. Photo Alper Böler. Used with permission. Is Russian Navy getting stretched thin? The frequency of the Ropucha and Alligator class ships conducting the Syrian Express deployment may not be enough to keep the troops in Syria as secong auxiliary cargo ship is quickly commissioned in service. M/V Alican Deval, previously owned by Deval Shipping of Turkey was sold to Russia. 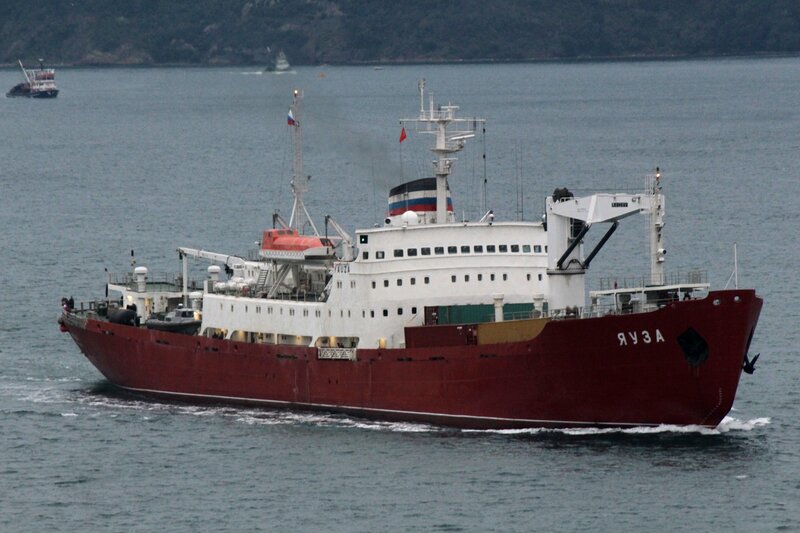 She was quickly renamed as Dvinitsa 50 and send to Syria carrying cargo and listing to starboard. 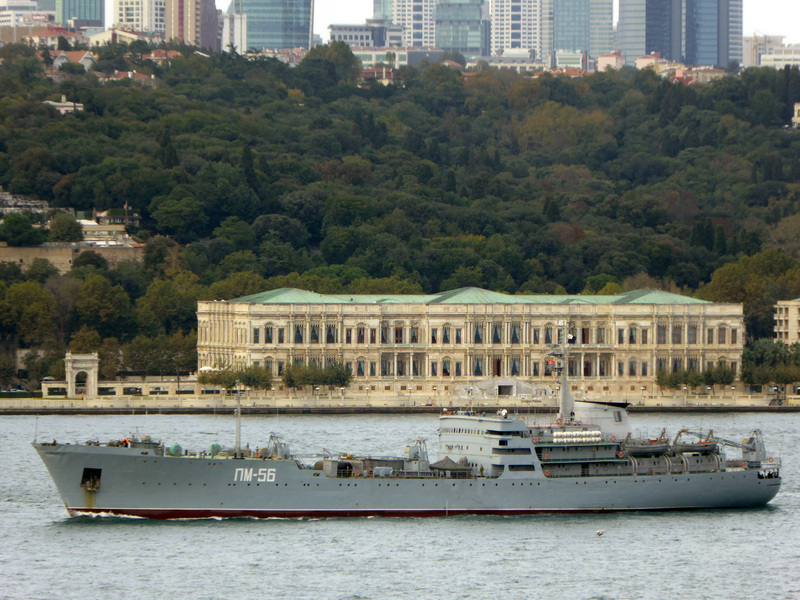 The Alligator class ships Saratov and Nikolay Filchenkov made south bound pasage through Turkish Straits just as Dvinitsa 50 and Yauza. While Ropucha class ships Korolev, Alexander Otrakovski and Tsezar Kunikov returned to the north. We were delighted to see the Bulgarian frigate Druzki and the Romanian minesweeper Sub Lieutenant Alexandru Axente going to south. The Bulgarian frigate is going to tak part in NATO exercise Trident Juncture 2015. I have no idea about the purpose of the deployment of the Romanian mine sweeper.